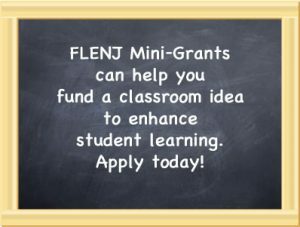 FLENJ offers mini-grants of up to $2,000 for innovative projects related to world language education. Proposals should demonstrate that the funding will have a direct impact on instruction in the classroom or on world language activities in the school. Preference will be given to projects that promote curriculum materials development or projects with techniques that enhance cultural understanding. Be a practicing educator in a New Jersey school. Commit to presenting the results of your project at the following year’s Spring Conference. award is required – and conference fees will be waived (you will attend the conference for free). Recipients will receive half of the grant money before the project begins, at the Spring Conference. The balance of the mini-grant money will be sent upon completion of the project, when all relevant receipts for expenses have been submitted. At the Spring Conference the following year, the FLENJ Mini-Grant Chair will host a Saturday workshop in which the recipients will, with others, discuss their projects and present their results. In the presentation year, the conference registration fee will be $50 only (as for all other FLENJ conference presenters). This year FLENJ was pleased to be able to increase the amount of the award for a very worthy project. Nathan Lutz, Dora Gragg and Ana Casas of Kent Place School in Summit will use their grant money to purchase science kits for their primary school program. The kits will provide hands-on activities to incorporate STEM content in the early language programs. We look forward to hearing more about this project at the 2016 Spring Conference, where these teachers will present their results. Join us during their session to learn how you can replicate their design in your own classroom! FLENJ is pleased to be able to reward the initiatives of our members and to provide much needed assets for the purchase of materials that enhance the world language programs in New Jersey schools. Congratulations to our recipients! The project serves an important purpose (address a need or opportunity or solve a problem) and clearly connects to the real world. The project meets a defined need or purpose and somewhat connects to the real world. Project meets a defined need. The project is clearly appropriate for designated levels; standards are well integrated; students will increase specific knowledge and skills. The project is somewhat appropriate for designated levels; standards are somewhat integrated; students will increase knowledge and skills. The project is not reasonable for designated levels; standards are not integrated; it is unclear what knowledge and skills will be acquired. The need for amount of monetary request is clearly established; the budget is clear and detailed. The need for amount of monetary request somewhat established; the budget is clear and complete. The need for amount of monetary request not established; the budget is unclear or incomplete. The project proposal is detailed, understandable, and answers all elements of the application. The project proposal addresses all elements of the application. The project proposal is unclear at parts or missing information. The proposal clearly outlines a plan for evaluation; the project objectives are clear, specific and measurable; the objectives completely align to the proposal. The proposal identifies an evaluation plan; the project objectives are clear; the objectives align to the proposal. The project will enhance the student experience by increasing proficiency, cultural understanding and engagement. The project will increase proficiency, cultural understanding or student engagement. The proposal does not clearly show that the student experience will be enhanced. The use of best practices in the project is exemplary; the project clearly implements at least 2 best practices listed to the left (or others not named in list). The project clearly implements at least 1 best practice listed to the left (or other practice that may not be named in list). Implementation of best practices is unclear or not stated.